Soak the chickpeas overnight in enough water to cover them by at least 5 cm. 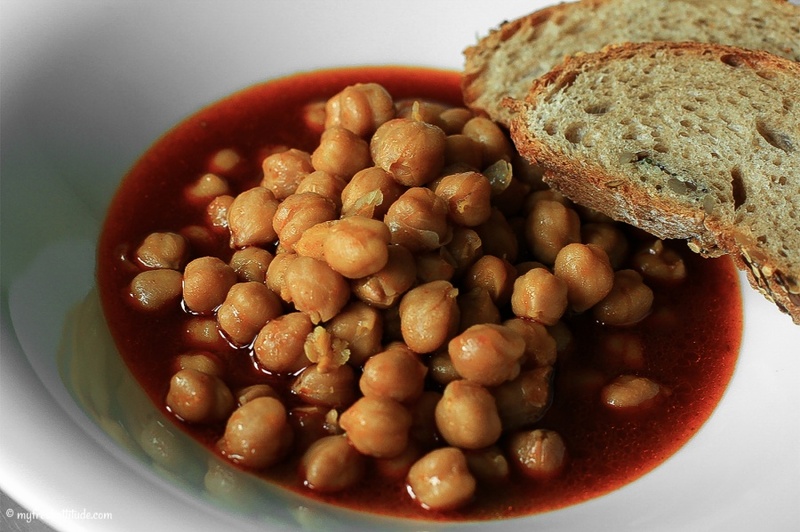 Place the chickpeas in a large pressure cooker and cover with water by at least 5 cm. Add the prepared garlic cloves, bay leaves, halved lemon and about 1 tablespoon salt. Bring the mixture to a simmer over medium-high heat then skim any foam from the top of the chickpeas before securing the top. Shake several times to set the pressure then wait until the pressure level rises to the second bar (this is the highest pressure setting). Reduce the heat to medium-low to maintain the pressure at the second level and cook for 25 minutes. Allow the pressure to naturally release, then remove the chickpeas with all the liquid to a clean pot. Remove and discard the lemon halves and bay leaves. Bring the mixture to a simmer over medium heat. Meanwhile, in a separate small pan, heat the olive oil over low heat and add the paprika and cayenne pepper. Stir well and very gently heat the spices in the oil for about 5 minutes. Once the chickpeas begin to simmer, add the cumin and stir, then add the oil and spices in a slow stream to the chickpeas. Stir well and stew for about 20 minutes uncovered. Adjust the seasoning and enjoy! No pressure cooker? Well, that’s not a problem. Just cook the soaked chickpeas in a lot of water over medium heat (covered) until they are nice and soft. This will take you anywhere from 60 minutes to 3 hours, depending on the age of the chickpeas. You can use canned chickpeas for this recipe, but I think the flavor of freshly cooked chickpeas is superior! One other tip…add 1/2 teaspoon of bicarbonate soda (baking soda) to the chickpeas before cooking them. This will help the chickpeas to cook quicker and more evenly.